A couple of months ago, my team and I received an email from a film crew who were shooting a documentary on the The Legend of Zelda franchise and were interviewing people all over the country who had grown up playing the franchise and were open to discussing the impact that the game had on their lives. 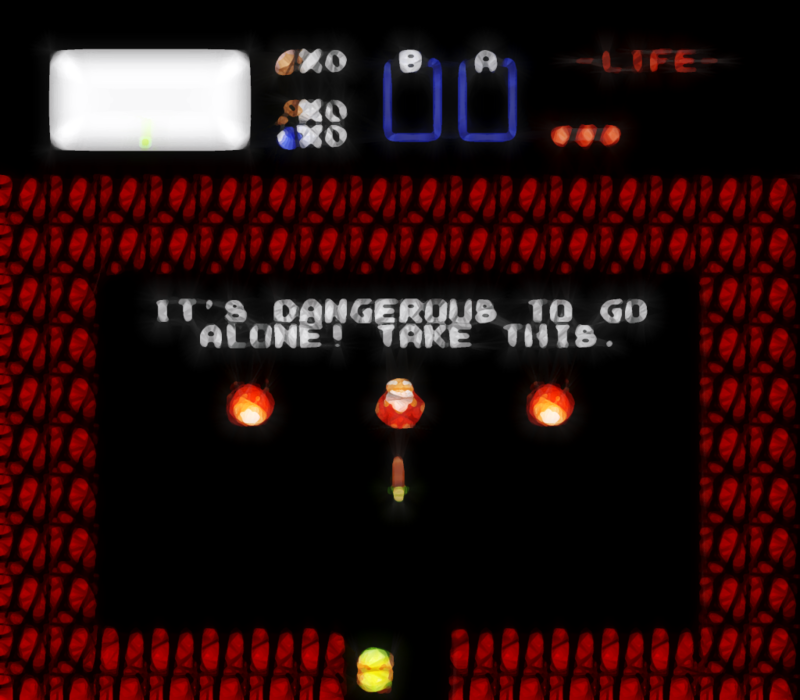 Yesterday, It’s Dangerous To Go Alone – the official site and trailer – went live. Though I rarely deviate from talking about development especially with WordPress on this blog, there’s a point that I made during the course of our interview that was mentioned on the website that I felt worth discussing here. For my generation, this has become somewhat of a catch phrase if not a mantra of sorts. I hope that one day, I can be a part of creating something that makes as much of an impression and has as much a lasting resonance with its users than the original Legend of Zelda had for me. During our day-to-day – at least for me – it can be really easy to lose focus of why I do what I do. Instead, I get bogged down with a lot of the details of managing a business, working on the finer details of a project, or generally hyper focusing on a narrow aspect of something neglecting to see the entire picture. This is normal, but I never want to forget my core motivation – to good work for other people. But at the risk of sounding like a cliche, I do think it’s dangerous to go alone and there are a number of things to remember when doing good work. Though I divide my time between working with 8BIT and managing my own company, I can honestly say that I believe you can have more fun, do more work, and achieve a greater level of success if you find the right team. This doesn’t mean that there aren’t stressful periods or that things always work out, nor does it mean that I dislike doing contracting work on my own, but there’s something to be said for working with a core group of people on something that’s larger than yourself. It’s extraordinarily easy to lose focus in the development industry. In fact, the rate at which new languages, tools, platforms, frameworks, and other libraries are released has never been faster. Just as you decide to pick your stack, it’s like four new things have come out all of which are vying for your attention. I think some developers are notorious for being attracted to the new shiny thing and feel compelled to try every single one of them out. But I’m much more of a fan of being a specialist than a generalist. Sure, I’d love to learn a lot of the new technologies and tools that are out there, but the truth is that it takes years to master something, and if I’m just now feeling fluent – or at least capable – with where I am now (after, say, three years) then why would I give this up? Furthermore, if I were to hop on to every new thing that came out, what would I ultimately master? This is not career advice. I’m not a counselor, and I don’t know if the job you have is the right job for you or not. The point that I’m trying to make is simply remember why you’re doing what you’re doing; otherwise, it’s more like meandering through your day doing something without any real point. That’d be somewhat of a tragic place to be. I don’t know if anything that I’m doing now or later ultimately will leave a lasting resonance with anyone. I hope it does, but I don’t fail to see the magnitude of the comparison of one of the greatest video game franchises in history and what I’m doing day-to-day. Then again, I don’t think there’s anything wrong with knowing your roots, finding inspiration in them, and constantly pushing forward to at least aim for that particular level of success. If anything, it provides a target to aim for and I’d much rather aim for something as epic as that franchise than anything less. Ha! Wow! I didn’t even know about the movie except for your post! Man, I was totally in love with the Zelda series all the way up until Majora’s Mask (which I thought sucked) and then that was the end of it for me. It lost its charm and I had a different view of the world and games in general. I think the concept of the film is charming, but at a critical point in life I found something that pretty much washed everything else away and I saw little point in pursuing childhood things other than in light passing. I want to see the movie now and see what various people he interviewed have to say. I wonder how many are actually looking for something they haven’t found. Yeah – it’s definitely a grass-roots kind of thing. They are working to kickstart some of the production costs, as well. There are a lot of really cool people being featured in the movie, so it should be awesome. Keep tabs on them – it’s supposed to be released this December. Next PostNext But Seriously, WordPress as an Application Platform?